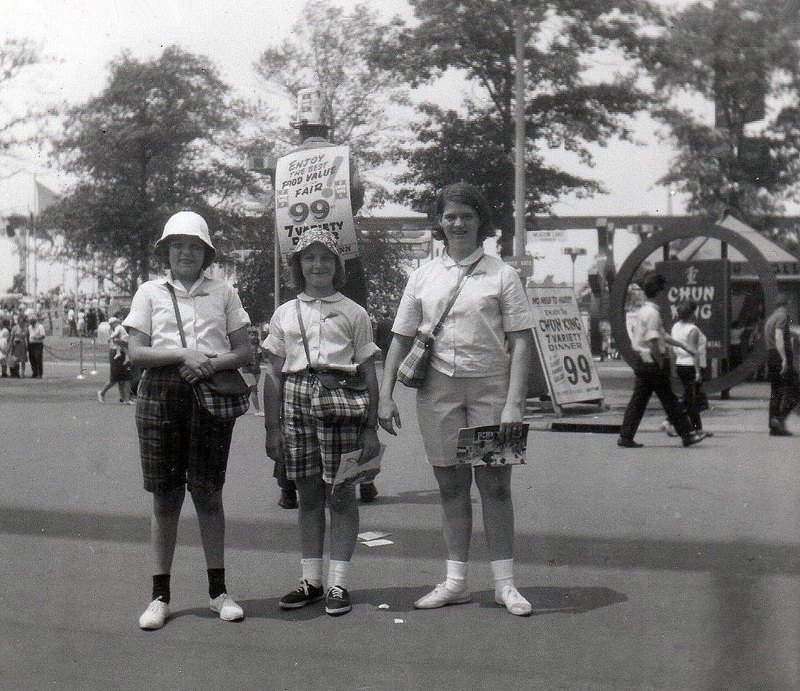 Fifty years ago the 1964-65 New York World’s Fair was underway, with thousands going through the turnstiles. Sooner or later they had to eat. 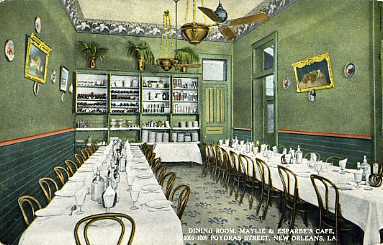 Some brought a picnic but others patronized the roughly 110 restaurants in operation the first season, up to nearly 200 in 1965. 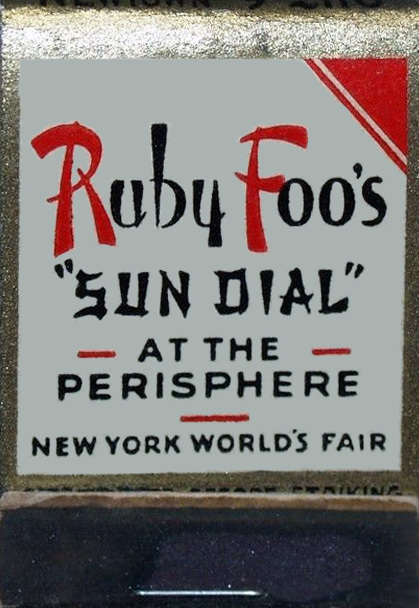 The Fair was not officially sanctioned by the Bureau of International Expositions nor supported by governments (for the most part); it was a commercial enterprise filled with corporate pavilions such as Johnson’s Wax, General Motors, and Travelers Insurance. 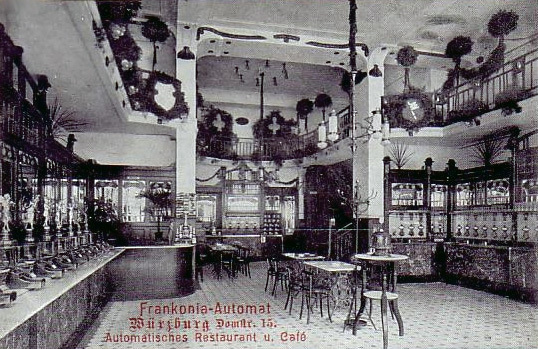 Most of the restaurants were run by private entrepreneurs who were not necessarily from the country represented by the pavilion. 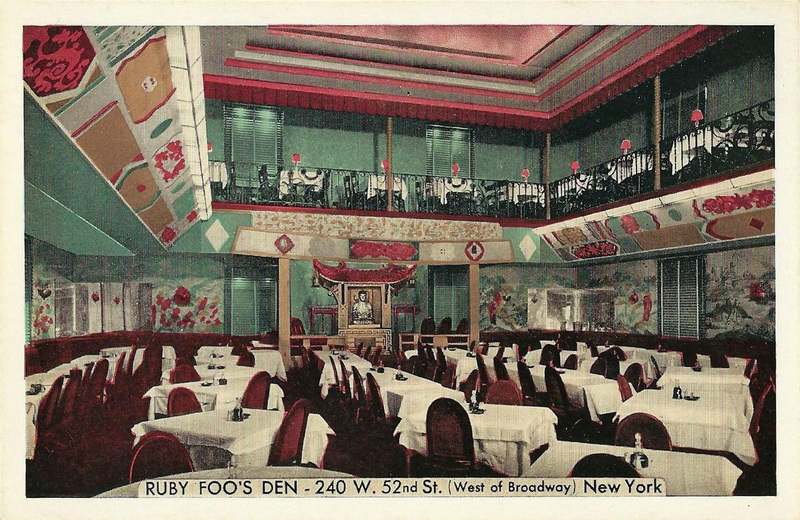 Restaurant Associates, which operated Mamma Leone’s, The Four Seasons, and others in NYC, ran the restaurant in the Indonesian Pavilion and five others. 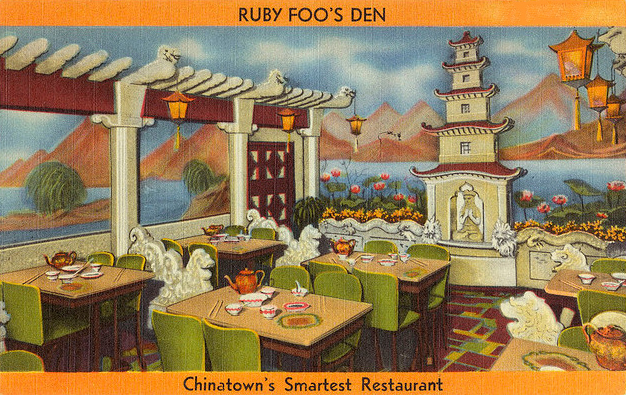 New York’s Sun Luck chain ran the Cathay Chinese Restaurant in the Hong Kong Pavilion. 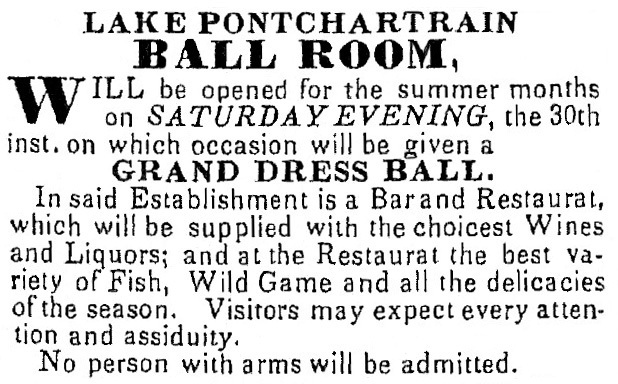 Biggest of all, the Brass Rail operated six moderate-priced restaurants, each offering a single complete meal for $3. In the International Plaza they ran both a cold Danish buffet and the Garden restaurant offering Southern fried chicken dinners. 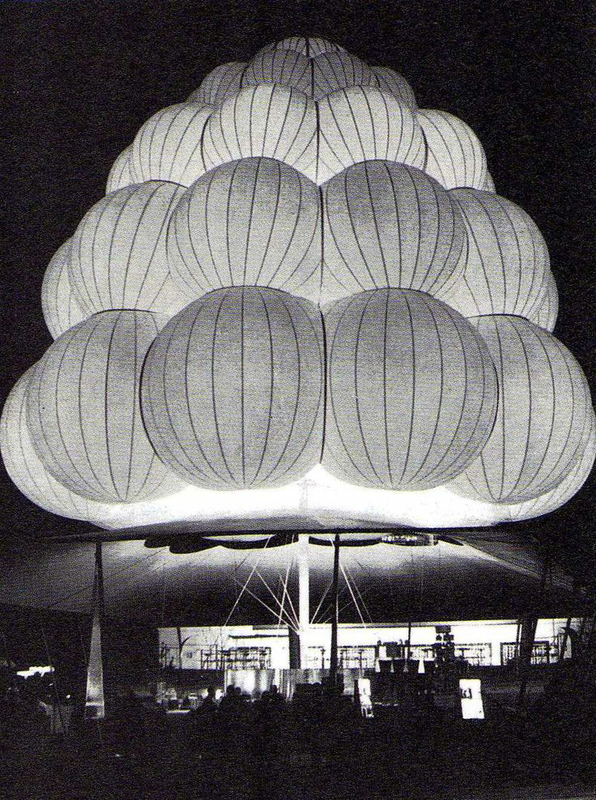 The company, a subsidiary of Interstate Vending Co. in Chicago, also had 25 freestanding snack bars with balloon-shaped roofs that looked as though they could lift off and float away. Most of the eating places at the Fair supplied casual food and snacks, whether strawberry and whipped cream filled Bel-gem waffles (the hit of the Fair), Wienerwald hot dogs, or Chicken Delight(s). Providing plentiful fast food was based on the belief that non-New Yorker Americans would accept nothing else. Keep in mind too that it was the mid-1960s before the culinary revolution came along with its hopes of replacing industrially produced convenience food. International edibles ranged from the passably authentic to the thoroughly Americanized. Yet however tame the Fair’s version of world cuisine often was, those fairgoers daring enough to go beyond burgers and dogs found a wide selection of food unknown to most Americans then. Among the many unfamiliar dishes were smoked reindeer at the Swedish Pavilion, spicy Korean spareribs, and stewed meat with peanuts and couscous at the Tree House restaurant in the African Pavilion. 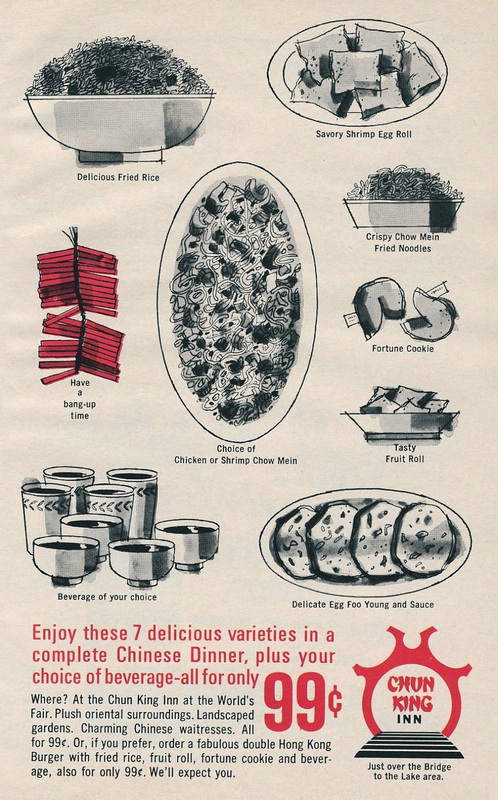 Representing American-style Chinese food was the Chun King Inn, whose mission was not so much to run a profitable restaurant as to familarize people with Chun King products sold in supermarkets. It won over the public — who often complained about high restaurant prices at the Fair — by serving full meals consisting of seven items for only 99 cents. The Inn also featured a double-patty Hong Kong Burger with cheese, lettuce, special sauce – and bean sprouts for an Asian touch. Many restaurants did poorly at the Fair, but Chun King’s president reported that the Inn served 5 million customers the first year. 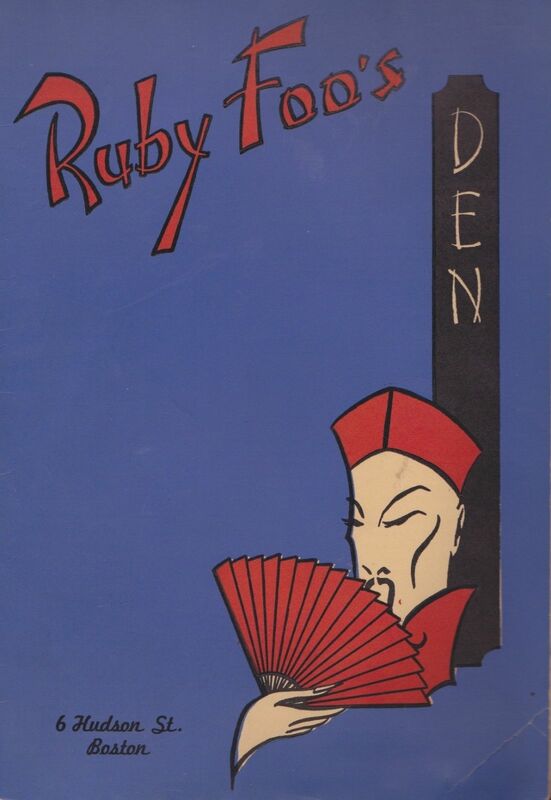 Probably the most successful restaurants were those directed by veterans of earlier Fairs, particularly Seattle’s in 1962 and New York’s in 1939. 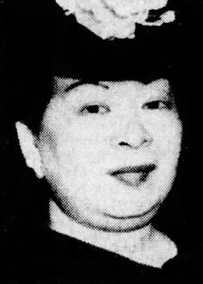 Repeaters from 1939 included the operator of the Century Grill who had run the Aviation Grill in 1939 and Schaefer Brewing Co. Seattle businessmen subleased a restaurant in the Fine Arts Pavilion named the Bargreen Buffet to Roy Peterson, proprietor of Seattle restaurants including the Norselander. 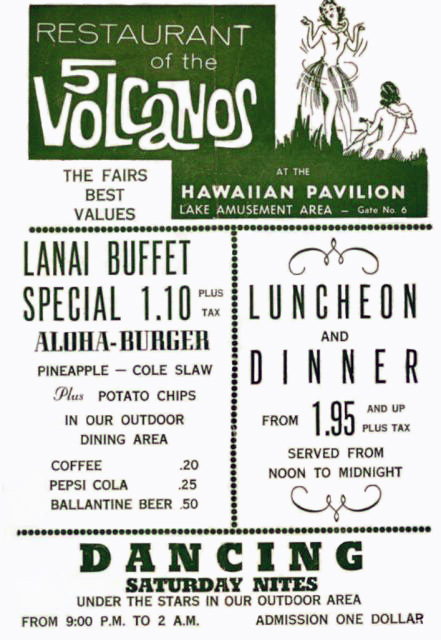 Another restaurateur from Seattle, William Moultray, did so well with his Polynesian restaurant in 1964 that Fair officials asked him to set up a restaurant complex in another pavilion. 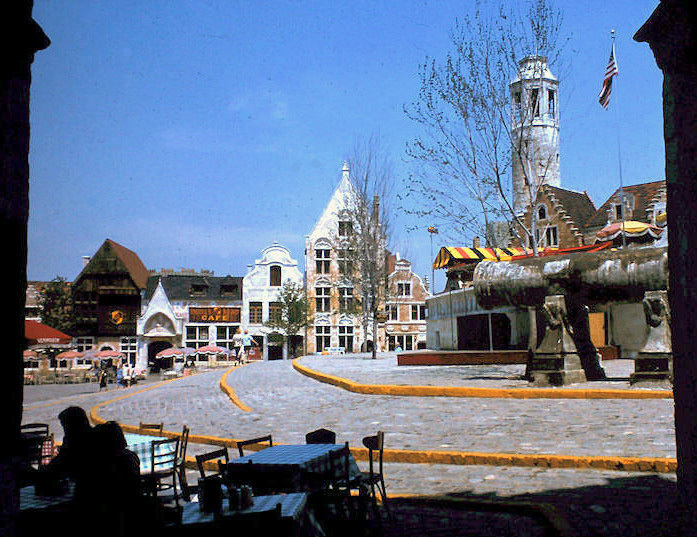 The Belgian Village [shown above in part] consisted of 100 buildings and 20 eating places, some of them outdoor cafes, but was not completed until the end of 1964. A similar village with some of the same buildings had been at Chicago’s Century of Progress Exposition in 1933. 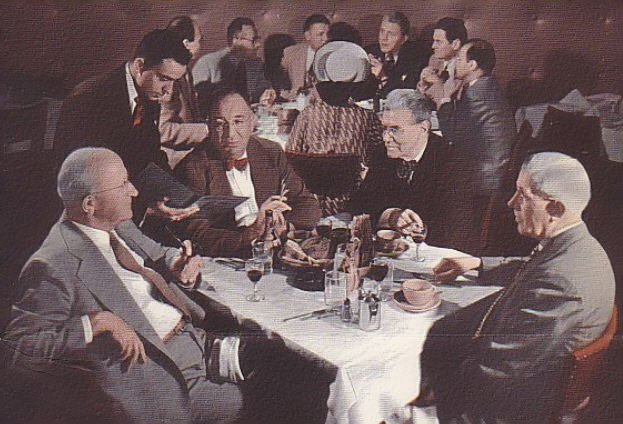 Although critics were disappointed that there was nothing to equal Henri Soulé’s 1939 French restaurant (origin of NYC’s Le Pavillon), everyone agreed that the restaurants in the Spanish Pavilion came closest. Unlike most, it was officially supported by Spain’s government, headed at that time by dictator Francisco Franco. 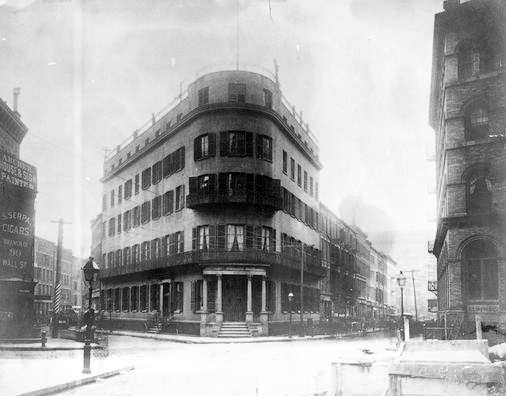 Two restaurants in the pavilion, the moderately priced Granada and the expensive Toledo, were under the management of Madrid’s Jockey Club which imported its chef and 40 of his assistants. 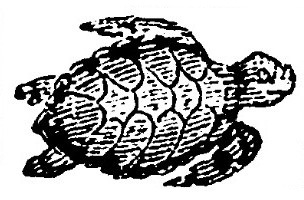 So popular was the pavilion’s outdoor seafood bar, the Marisqueria, that it was enlarged in 1965. It was under the direction of Alberto Heras who opened a Spanish Pavilion restaurant on Park Avenue in NYC in 1966. Heras was one of several restaurateurs who tried to extend their success beyond the Fair. 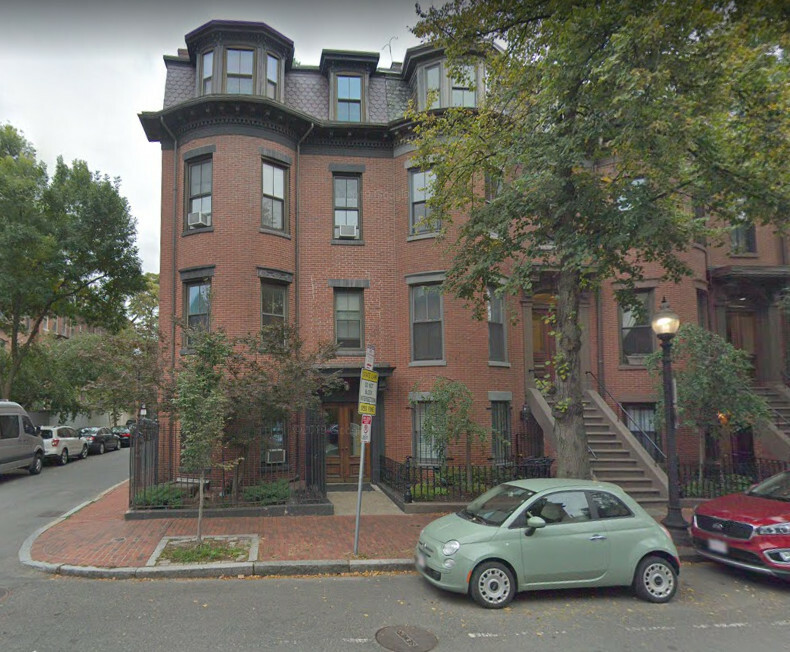 The Spanish Pavilion building was removed to St. Louis by then-mayor Alfonso Cervantes, where it housed three restaurants that met a rapid demise. 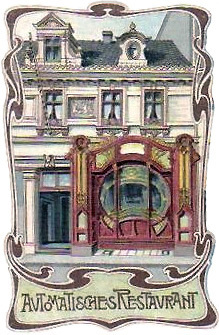 The maestro of Wienerwald, Friedrich Jahn, extended the Europe-based chain into this country. It had grown to 880 units by the early 1980s when it failed. The Petersons of the Bargreen Buffet took over management of New York’s venerable Janssen’s restaurant. The Wisconsin Pavilion’s Tad’s Steaks, with its popular $1.19 sirloin steak dinners, became a fixture with bargain-meal hunters in NYC. Although the Fair fell short of meeting its attendance goal of 70 million, drawing only 52 million fairgoers, it’s likely that millions of them carried away lasting food memories. I am happy that I had a chance to see this fine exhibit at the New York Public Library while I was in the city for a conference. It showcases menus, pamphlets, manuscripts, and other materials from the library’s collections, and also features actual hardware from the Automat, particularly a reconstructed wall of Automat cubicles. Alas, they have no food in them. The exhibit is divided into four themes: eating places that furnished quick lunches, eating places where “power lunches” took place, home lunches, and charitable lunches, a theme which includes soup kitchens and early school lunch programs. Of course I was primarily interested in the first two themes since both are about restaurants. 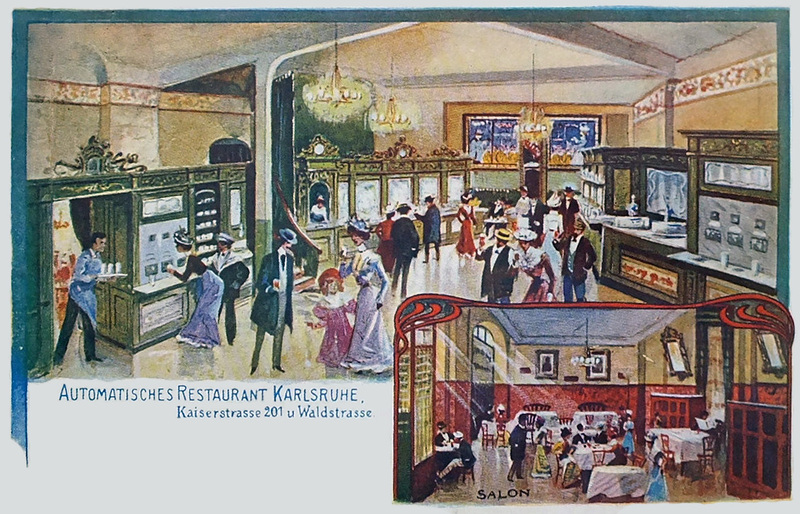 Other than the Horn & Hardart Automat, places such as Childs’ restaurants, Sardi’s, the Forum of the Twelve Caesars, and Schrafft’s were profiled with displays of menus, drawings, photographs, and other memorabilia. I was particularly fascinated by two large map sheets which presented mid-town Manhattan in great detail, showing the names of each of the businesses lining several streets. Published in the 1950s by Nirenstein’s Realty Map Company of Springfield MA, similar maps were made of many large cities in the U.S. I must see more of these! It was delightful to see a photograph of Miss Frank E. Buttolph about the time she launched her menu collecting project whose results formed the basis for the library’s vast menu collection. There are a few areas where I would have slanted things a bit differently or included additional material. As is often the case when the historical focus is on one city (or country), its uniqueness, greatness, or innovativeness tends to be overstated. 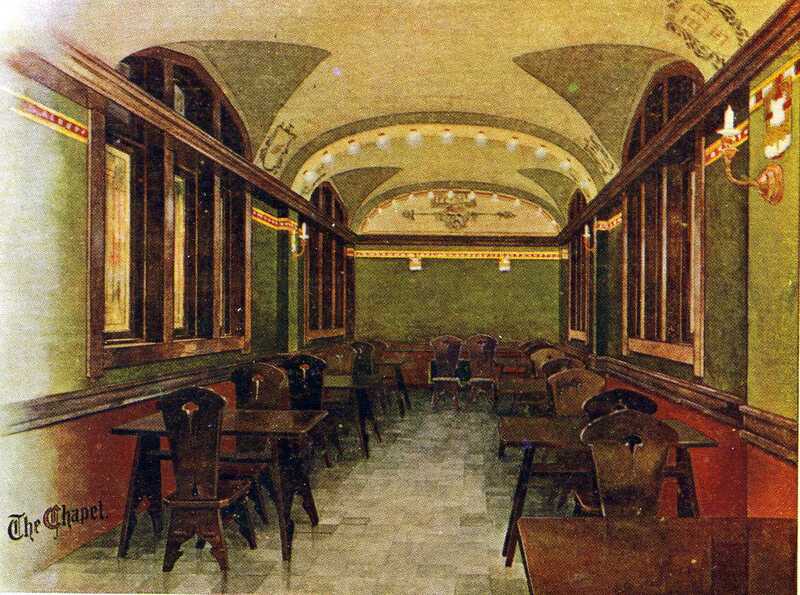 For instance, New York was not alone in having early fast food lunch rooms – all big cities did. Nor was it a pioneer in the development of the cafeteria. 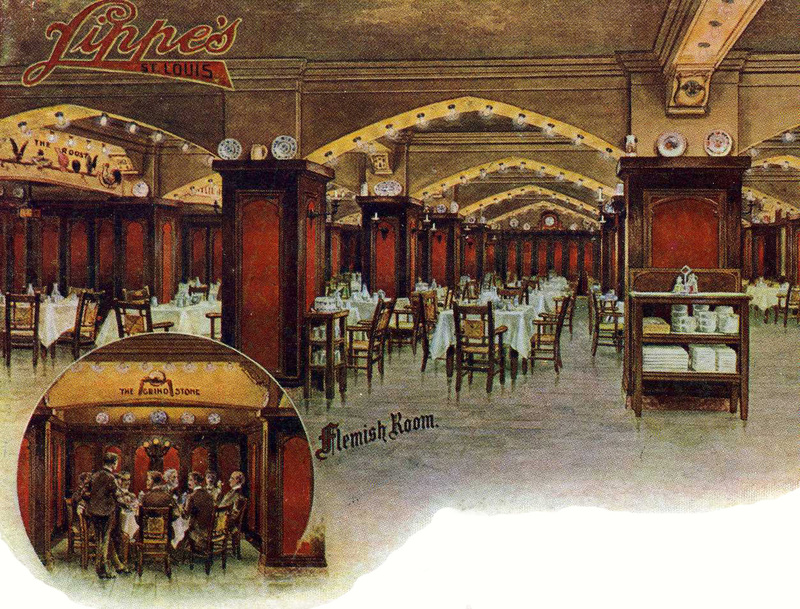 Chicago and Los Angeles both played a greater role in the early days of the cafeteria. 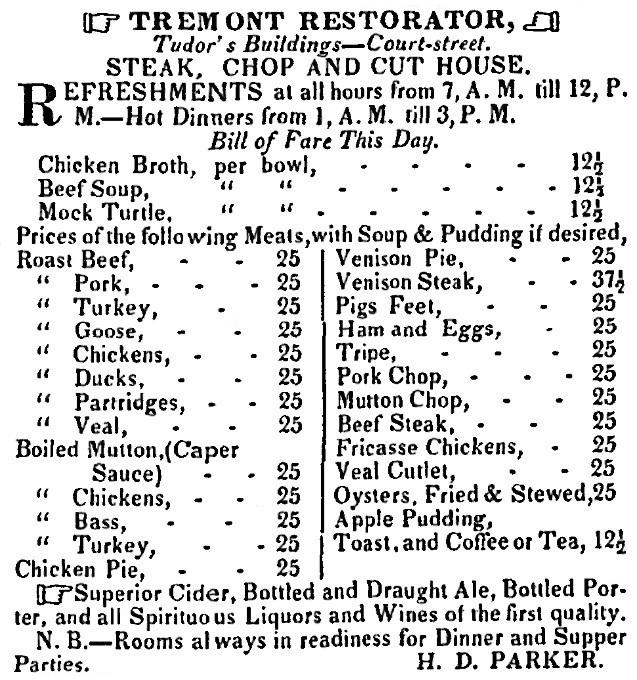 I think too that I would have paid attention to the saloon lunch, since it was a very popular method of acquiring a quick lunch. 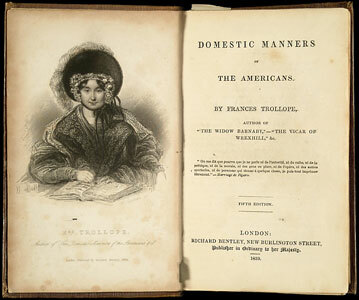 Temperance advocates portrayed saloons as loathsome places but, as some anthropologically-minded reformers pointed out, saloons also functioned as welcoming community oases and cheap eating places for many low-income workers, men in particular. But these are minor criticisms of a show that is well-researched and presented and will certainly delight hundreds of thousands of visitors as well as proving a valuable resource for teachers. The free show runs until mid-February 2013 at the main library. A promo for the exhibit is on youtube.